Gotta leave time to smell the flowers. Arthur is our cat, our wonderful companion and long-suffering sea-cat, whom we sometimes called our oce-little. We got him and his sister Nikka when they were just kittens, and they lived at home with us for almost six years before we moved aboard Ocelot. Nikka definitely wouldn't have liked it onboard Ocelot - she was a huntress, and needed large fields and small mice and the thrill of the kill. 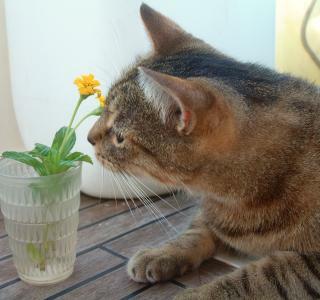 So we gave her away to a friend of a friend, where she lived for several years happily hunting and doing her own thing until, sadly, she got sick and died. 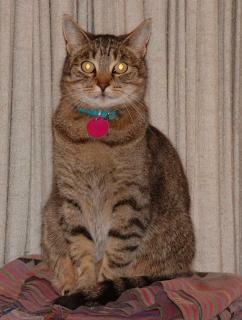 But Arthur was our sweetheart, our lap-cat, and especially dear to my own heart. He slept on my bed, lay on my lap as I tried to read a book, twined around my legs when he wanted more food. I was already leaving my friends and my home to live on a sailboat I had never seen and sail a world too large to imagine. There was no way I was going to leave my Arthur, too. So we brought him along. I've thought now that it was probably a rather cruel thing to do to him. HE got uprooted too, without even the consolation of a proper litter box, dirt to run on and trees to climb, and a stable house to sleep in. He never took to the water, as some cats raised from kittens on boats do. He loathed sailing, and probably felt it was some personal torture we put him through. We almost lost him twice in the first 24 hours we were in St. Martin. First in our hotel room, where he'd managed to climb between the mattress liner and the springs, and then in the boat yard, where he jumped to the monohull next to us and hid under its dinghy when it started to rain. I nearly despaired. Had we brought Arthur to a situation he couldn't cope with? Things settled down when Ocelot got into the water. Arthur couldn't run off and get lost, and he started taking an interest in the boat - namely how soft the cushions were and how long he could take a nap on one until someone had to move him. I can't believe how much cats sleep. It's truly amazing. 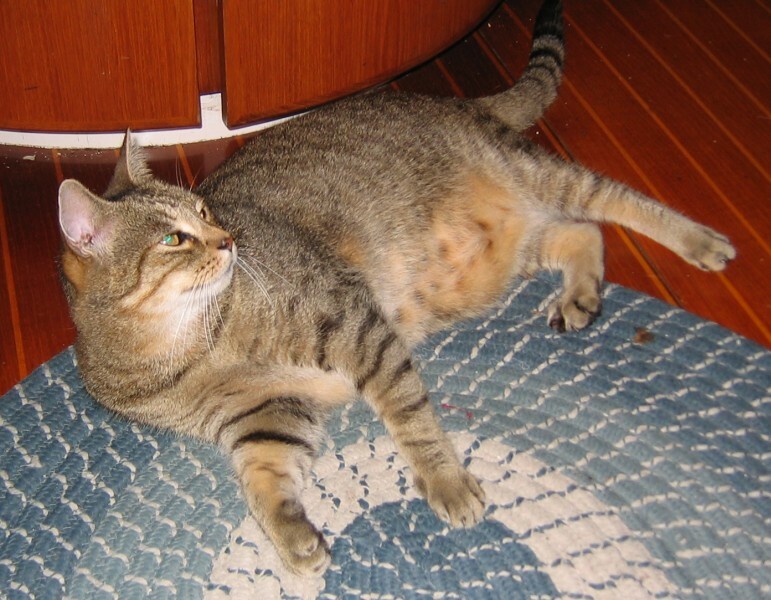 It would have been nice to have stories from other sailor-cats before we brought Arthur on board. At least it would have given us a few answers to questions we had to stumble through on our own, though of course every cat is different and rather individual. 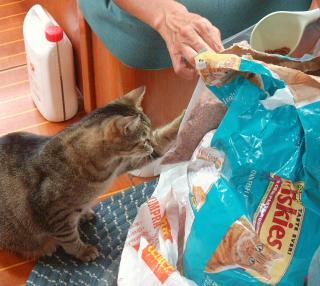 Arthur's dream come true - cat food heaven. For some reason, Arthur never liked fish. What sort of cat doesn't like fish, you ask. Well, perhaps one which has lived all his life on dry kibbles, not even wet canned cat food. Back home he'd bring in a mouse or two occasionally, but actually frequently didn't even kill the thing, let alone eat it. Live food just didn't appeal to him. So we brought plenty of cat food with us, and stocked up on brands he liked whenever we could find them. Big stores usually had it, though dog food was far more common. In Ecuador or the Galapagos we found a massive bag of the stuff he liked (Friskies fish flavor) and vacuum-packed it in small bags to keep it fresh. This lasted him for quite some time, but we were able to buy more in Tahiti. Room service please... thank you, Sue! Some cats we know on boats sit on passage waiting for the sound of flying-fish hitting the deck so they can go and have a feast. Not so Arthur. Not interested, no siree. Actually, on passage all he cared about was being up on the helmseat, preferably buried deep between someone's back and the back of the seat, or hidden from the elements under a towel. Every now and then, when he got his sea-legs and the weather was calm, he'd go for a bit of a jaunt around the deck. On quiet nights, he'd chase moonbeams on the cabin-top. But he'd never go below. I can only imagine that to him it sounded like being in a washing machine. Catamarans are not quiet boats, and every splash and rush of water flowing past must have been terrible. For the most part, he sat on the helm seat and demanded room-service when he was hungry - usually by biting whoever was sitting up next to him. Just a gentle bite, but if he did it often enough you'd sure notice. And although he never got it otherwise, sometimes on passage we'd give him a little bowl of milk to calm him down. He never got seasick, though, which we were all glad of. For a litterbox we tried several different things. A true litterbox let the rain in, and that was no good. We eventually bought a big box with a lid, cut a hole in the side for him to get in and out of, and raised the top so he had plenty of room. This kept the rain out and gave him privacy, which I felt he appreciated. Next question, what to fill it with? Real litter we didn't want to deal with, seeing as it can be expensive, is not available everywhere, and it has this annoying habit of clumping when it gets wet - a fate we couldn't guarantee wouldn't happen in the bag, before being used. Another idea was sand, which is available anywhere there's a beach and is rather annoying when it's wet but still works. But our main goal was to wean him off litter of any kind and have him just use a piece of indoor/outdoor carpeting. It's not messy, doesn't track sand all over the boat, and easily cleanable - just tie it to a string and toss it over the side. The water cleans it just fine. However, we had several problems with this. Perhaps we chose the wrong indoor/outdoor carpeting, because the piece we had was plastic and springy, not at all like the grass Arthur was used to from his previous life. Maybe he was just finnicky. But sometimes he'd use it, sometimes he wouldn't. The biggest problem was when we left him in French Polynesia for what was only going to be two months but turned into five. A local teenager paddled out to see him every day, feed him and change his 'litter'box, but this obviously wasn't enough for Arthur and he started rebelling by using the top of the (cloth) bimini instead. That was a hard habit to break him of. Of course, the thing we were terrified of was the possibility that Arthur might fall overboard. Could he swim? All cats can swim, it's ingrained. But would he panic? Would he know how to get back aboard? If he fell overboard while we were sailing, there was basically no chance of us getting him back again, which is why I was partially relieved that he didn't seem inclined to leave the helm-seat. But at anchor, with a rogue wave or something, if he slipped and fell, what would happen? Yes, we have teak decks and yes, he still had all his claws to hold onto the deck if he needed to... but we did clip his front claws so he didn't inadvertently shred any piece of cloth on board. And the possibility of him falling off was always there. After all, each of us has probably done it a time or two, doing something stupid like trying to step over the life-lines or standing on the transom and losing our balance. Why should Arthur be any different? We wanted to know he could get back aboard, and we wanted HIM to know he could get back aboard. So we orchestrated a little training course. It was rather funny afterward, actually, and Arthur didn't seem to be any the worse for it. The plan was to carry him down the sugar-scoop and place him in the water and see if he could get back up. Chris was in the water in the possible event that something went wrong - though we all knew that he'd get shredded by Arthur's claws if he had to assist. Mom carried him down the sugar-scoop, but with every step down she took, Arthur went up until he was basically sitting on her shoulder, holding on very tightly with his claws. So that didn't quite work. Next try, she turned him around so he couldn't grab her but was staring into his doom. Poor guy. But mom was able to drop him in the water, a foot or two from the transom. He dipped under, bobbed up, turned around, mastered the wooden swim ladder instantly, darted past Mom and me, ran through the cockpit and into the salon, jumped down the steps and raced up onto my bed where he huddled, wet and miserable and looking rather like a punk cat, with spikes of fur sticking out all over. 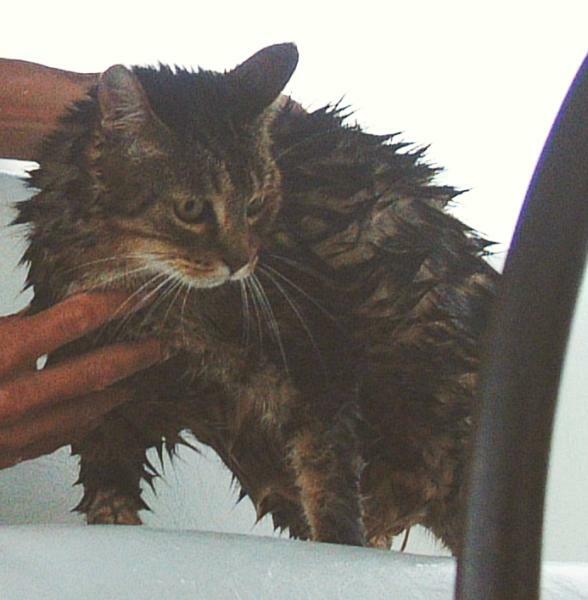 So the mission was a success, though I had a wet spot on my bed and a rather disheveled cat to rinse off and reassure. Thankfully, he never had to employ his excellent re-boarding procedures other than that one time. He never fell overboard, which just goes to show that humans are a far clumsier species than cats. He left the boat once, to go to a vet in Panama to get shots. I don't believe we told the Panamanian officials because it wouldn't have been allowed, but we wanted him up-to-date on everything as we went into the Pacific. But the whole time he was remarkably healthy. The only other times he 'went' to the vet, the vet actually came to Ocelot - this was once in Tahiti, where he had to be examined to allow him to 'enter' the country (never mind he'd been 'in' the country for 3 months already) and once in Tonga, where the vet had to get a blood sample to get a rabies test - this was in preparation for going to Australia or maybe New Zealand, where a rabies titration test within the last six months is required. Otherwise, he never stepped foot ashore. I believe he was happier like that, because the dinghy ride and his carry-box he absolutely loathed. We know some cats on other boats who love the dinghy and will go ashore whenever they can to climb trees, run around... and actually come back when it's time for the people to go back to the boat. One cat we met in the Caribbean would actually go fishing from the top of the solar panels - see some fish below, leap in, usually miss the fish, climb back up, and repeat the process. I'm glad Arthur wasn't that insane. None of the countries we entered had a problem with Arthur. Of course they all said he had to stay on the boat, but that was it. No big deal. We'd given him a microchip identifier before we left the States (a tiny chip inserted into the back of his neck, which displays a number when swiped by the correct machine) and had to write that number down several times in case he got lost ashore... but we knew that wasn't going to happen and it never did. Things were going well as we crossed the Pacific. Arthur was getting fat and lazy, and we didn't do passages too often. But in Fiji, the next large stop was Australia. And Australia, as they perhaps should be with their history of horrible introduced species, is very strict on their importing of pets. 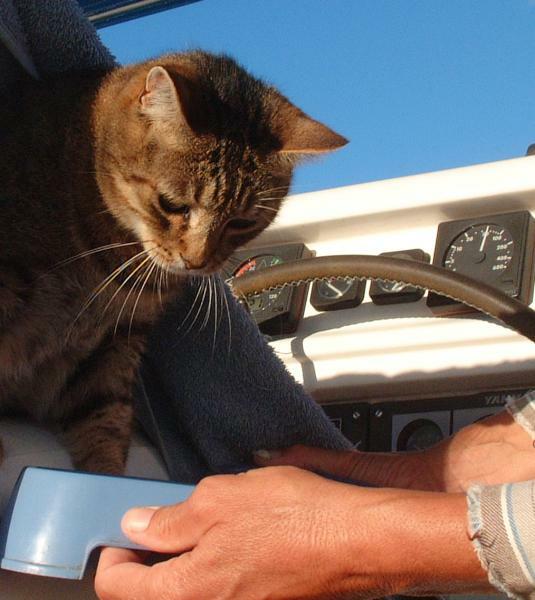 Fees, one-to-three-month-long quarantine, and not moving your boat are all potential hazards for bringing a pet in, regardless of whether your animal has all its shots and hasn't been ashore anywhere in the past two years. We didn't want to risk anything, and finally admitted that Arthur really would be happier back on land, not having to worry about water or wet cat litter or living in what might as well be a washing machine. The timing was good, as my cousin was just about to fly back to California and my grandfather had offered to take Arthur. Sadly, with many tears and farewells, we loaded Arthur onto the plane with my cousin Rori and for the second time flew across the sea to a new life. He lived in the suburbs of Los Altos, California, for one and a half years (March 2005 to Oct 2006). Unfortunately there was also a Pomeranian living in the house, and after that long the dog had had enough. Arthur was harassing it and terrifying it to bits, meanwhile playing Houdini and getting through closed doors and sometimes disappearing for days on end - presumably looking for his old home and people. He finagled his way into the hearts of my grandfather and his wife, but the dog was there first and when the dog started going slightly paranoid whenever Arthur was around, they started looking for other options. Fortunately my uncle, my dad's younger brother, and his family live in a forested area of Santa Cruz. Their sons had lived with dogs all their lives and were good with animals (Arthur had been terrorized by a 2-year-old visitor in the Carribean and was thoroughly off little kids) and they offered to take Arthur. So now our beloved Arthur is exploring the woods of Santa Cruz, ignoring the two local dogs who are much bigger and older than him, and coming home to sleep in the loft next to my two cousins. We miss him dearly sometimes, but we're sure he's much happier where he is now than if he'd stayed on board with us.